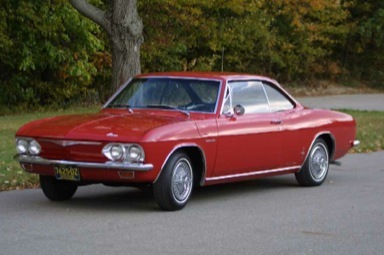 Corvair Street, Autocross, and Racing Wheels and Tires. To help you get a better idea of what kind of wheels you might like on your Vair, here are some photos, along with details on the setup used. This is our '62 700 wagon, the gold XXR wheels on the left were stolen, I've replaced them with some Datsun 280ZX wheels. These wheels are 4 5/8" backspace 15x7" XXR Minilite style wheels with 205/55-15 BFG gForce tires on them. They worked well, and are about the biggest setup that will fit on an early. 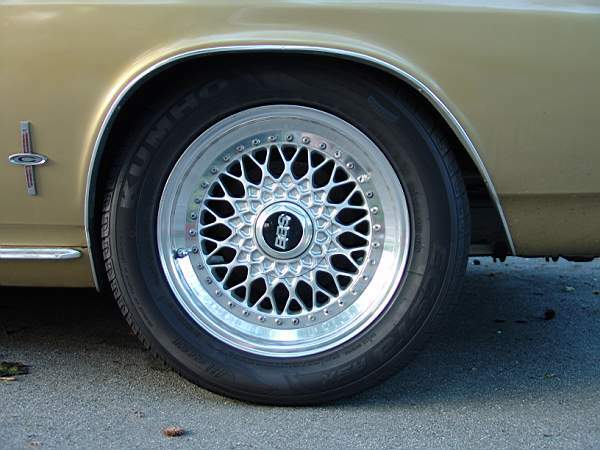 This set are factory Datsun 280ZX wheels, they are 15x6" and have a backspace of just under 4". 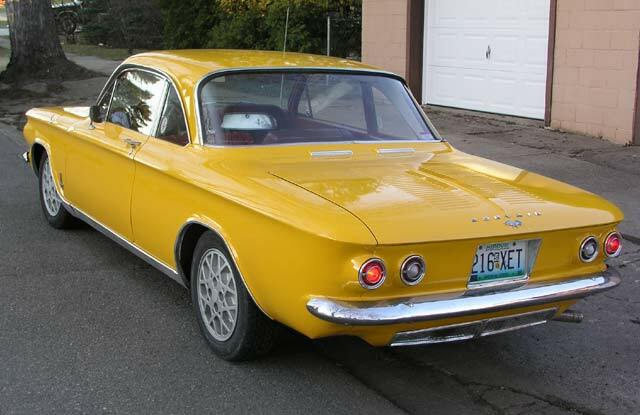 With 205/60-15 tires, the only trick to getting them bolted on the car is using the correct lug nuts with a Datsun shank and Corvair thread. I splurged on some custom wheels from www.petepaulsen.com in California. They had a special on for Corvette style Rally wheels, available with the required bolt circle for $10/wheel extra, and they threw in the special 4.5" backspace for no extra charge. 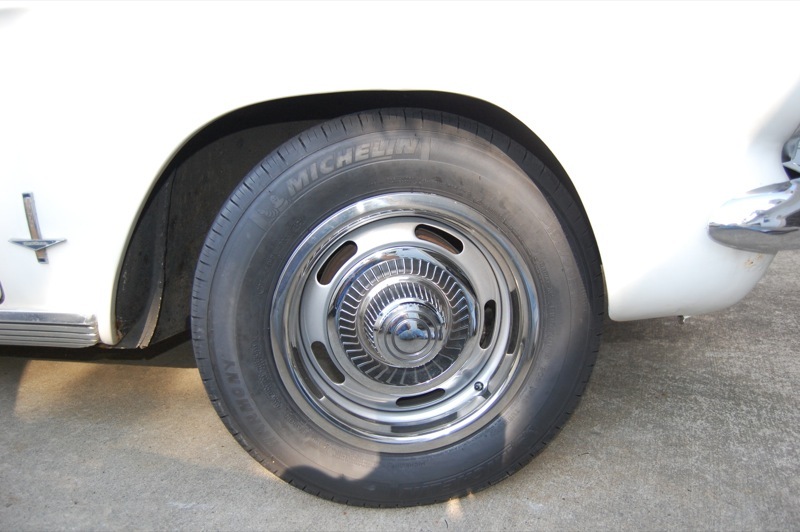 Tires are Michelin Harmony P195/70R14, I have been very pleased with them. 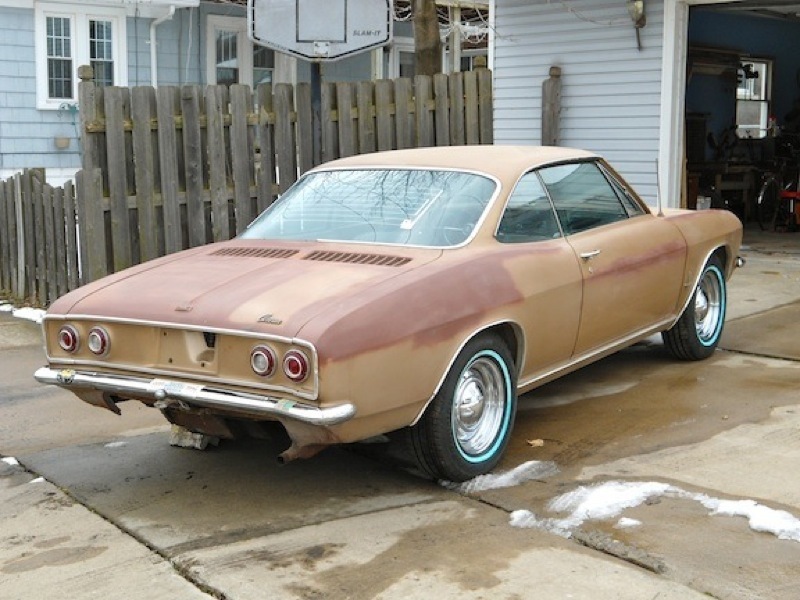 This is Jeffery's '62 700 coupe. 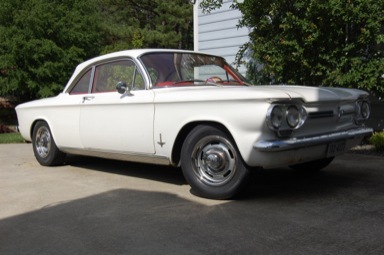 I just installed a set of 17 inch Racing Harts on my 62. The clearance is perfect with 205/40R17 tires. I did have to install 1 inch spacers so they did not hit the ball joint in the front and swing arm in the rear. 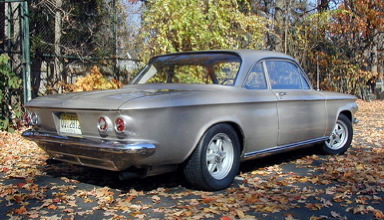 This is Albert's '63 700 coupe. 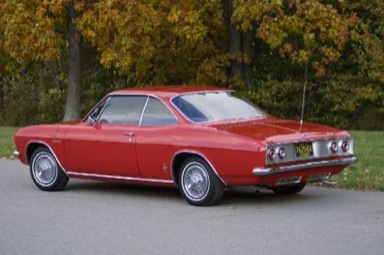 It was ordered with the Police option and is equipped with a 102 HP engine 4 speed transmission with 3.55 posi, metallic brakes, push button radio and the comfort and convenience group. It has 56000 miles on it. 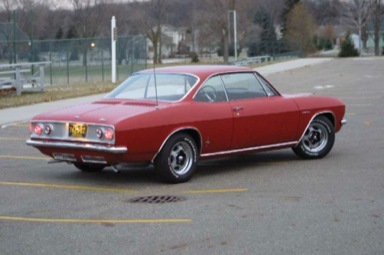 I resealed the engine, added a magnesium cooling fan, rejetted the carburetors, recurved the distributor, fabricated a dual exhaust system and tuned the car to "Bill Thomas" specs. I installed KYB gas charged shocks on the front and KYB full gas shocks on the rear. 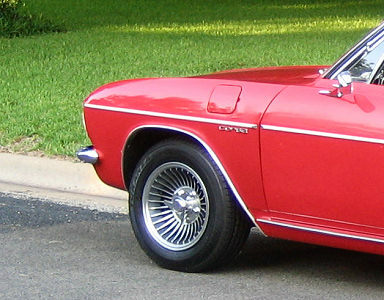 The wheels are from a 1978 Datsun 280Z. I had to have a machine shop make collars for the lug nuts and cut them to reduce the shoulder length to center theÊwheel on the hubs. I attached a thin aluminum disc that says Chevrolet over the stamped Z on the centers. I installed 195/60 14 BFG Comp T/As on the front and 215/60 14 on the rear. That combination with the 14 inch BFG 60 series tires have really improved the handling. 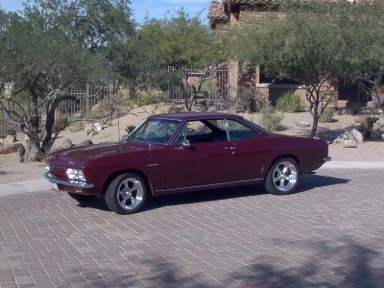 This is Tim's '64 Monza coupe. Wish I could tell you more about the rims. They came with the car when I bought it. All I know for sure is they are 15" Nissan alloy rims. Someone told me they are from 1989, but I don't know that for a fact, but they ARE Nissan. Tires are Kelly Chargers P195 60R 15. 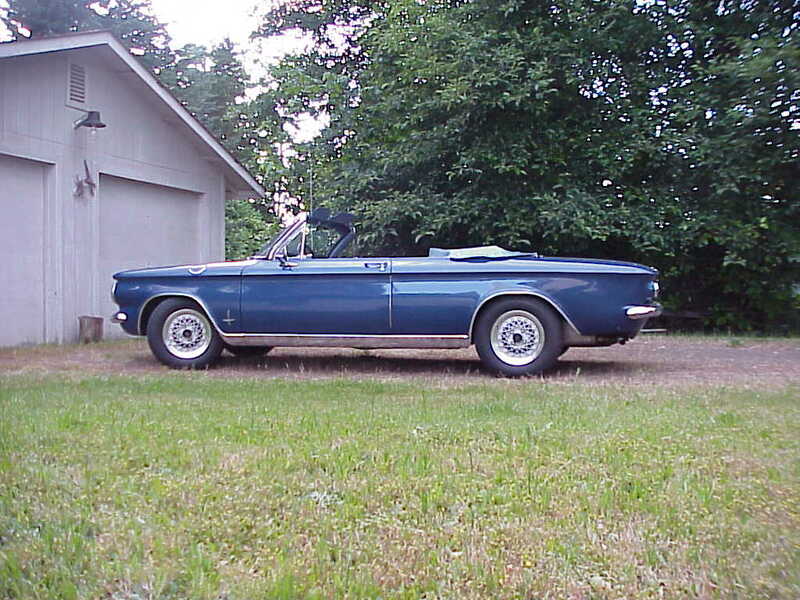 This is Ray's '64 Monza convertible. 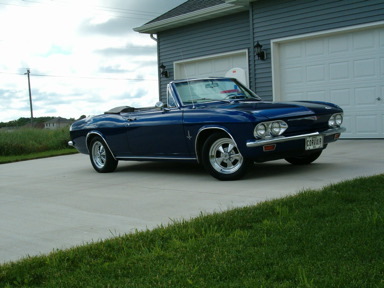 The car I have is a 1964 Monza convertible with quick steering arms purchased from Clarks Corvair Parts. 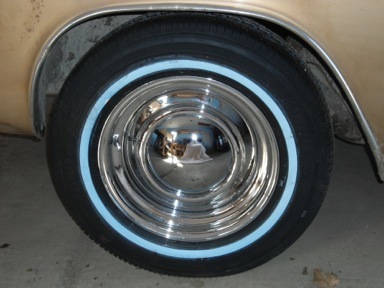 I ordered some used 14x6 Enkie Apache wheels with 4-1/4" backspacing. 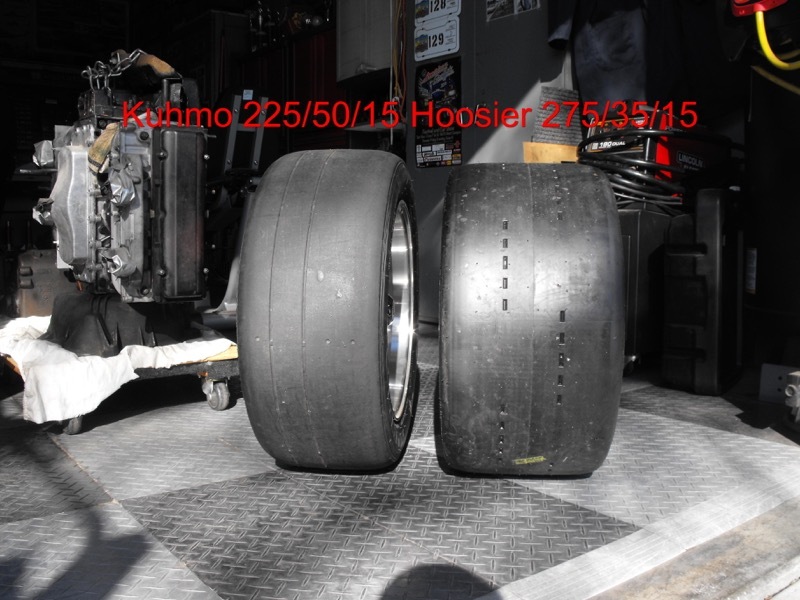 Tires are 205/70-14 Toyos. Did not have to do any modifications at all. They do fill up the wheel well. 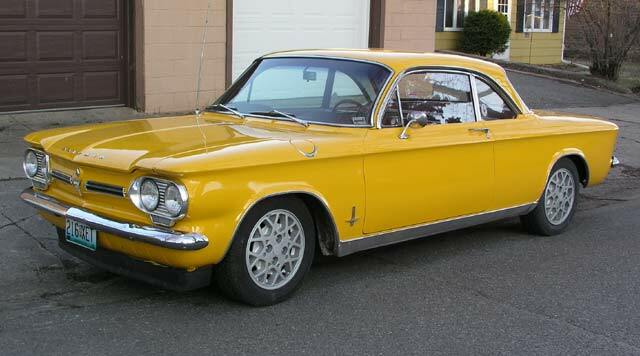 This is Jim's '65 Corsa coupe. I always wanted to put American Torque Thrust II's (TTII's) on it. 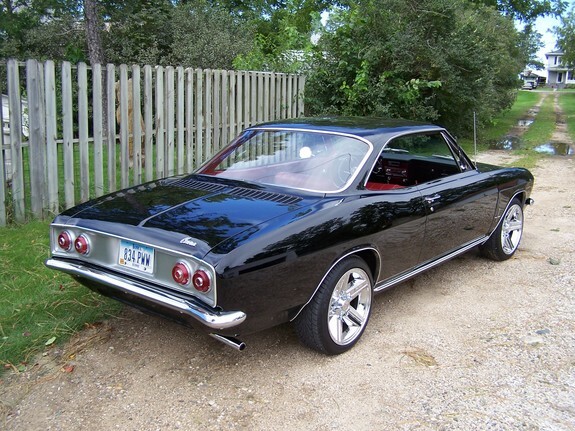 I have seen a couple of late Corvairs with them and liked the look. I had seen some with 16 x 7's on the back and 15 x 7 front, others did the 16" all the way around. I started playing with sizes etc on the Newstalgia Wheel website (nice people to deal with). I ended up going with 17 x 7 rear and 16 x 7 front. I put Kuhmo ECSTA 711 tires on them, 215 50 17 rear and 205 50 16 front, with standard backspacing. They've worked awesome! The 25.1" OD rear's have gotten my highway RPM's down very nicely and the 24.1" front OD has made my speedo dead on. I verified the speedo with a Garmin GPS. I also like the looks. I plan to get the HD front springs from Clarks to drop the front 1/2 to 3/4 inch. Otherwise right now the springs are fresh stock (installed during restoration a few years ago). No rubbing or clearance problems at all. I thought I wanted to share this info so others can benefit from what I learned. I really drove myself crazy trying to decide what I wanted to do. All the pondering was worth it. Hope this helps and will benefit someone. 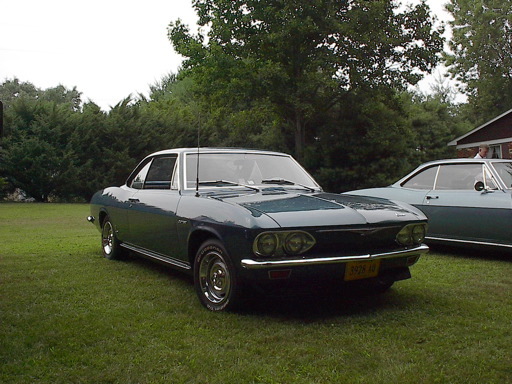 These two are of Wayne's '65 Corsa coupe. He has 14x7" Rally wheels, completely chromed with Corvette center caps. 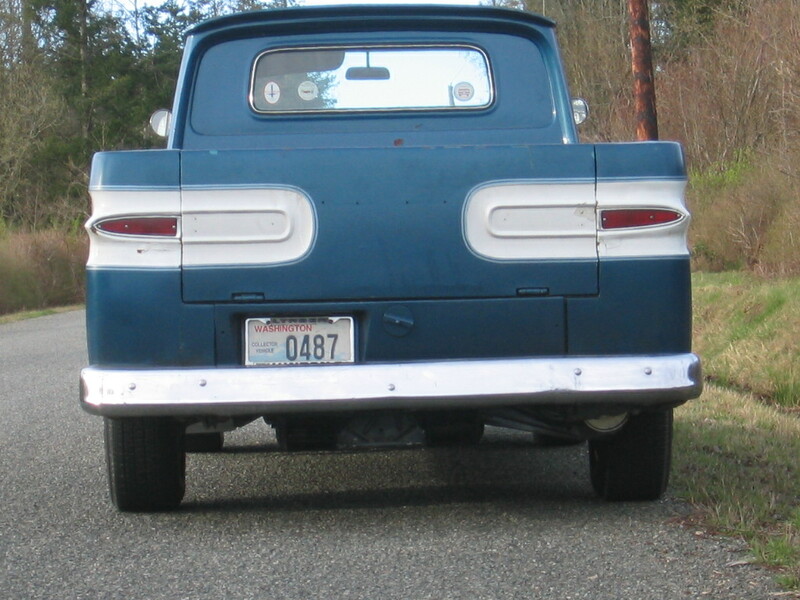 Tires are 215/60-14, note the tight clearance on the front. Wayne has stock height springs, a lowered car would be a bit closer. This is Venice Cox's '65 Corsa turbo coupe. 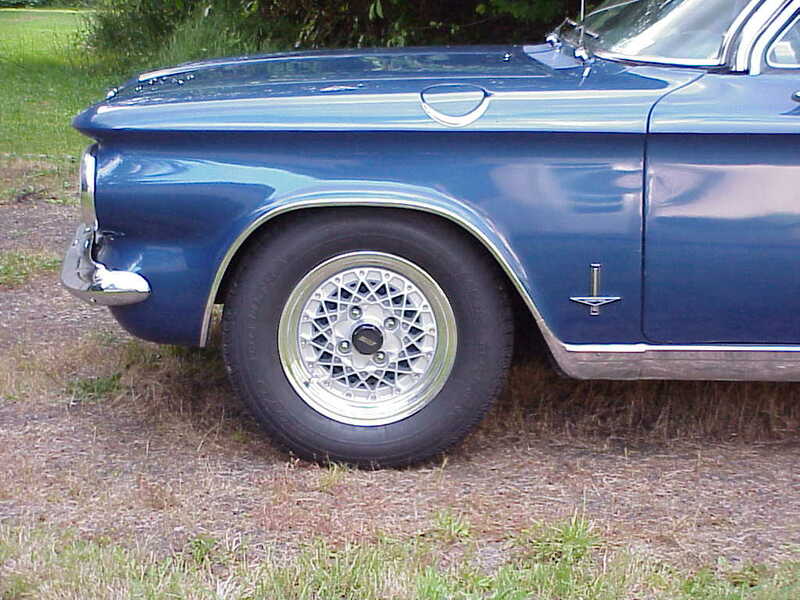 This is what you might consider a "stock option" wheel package. 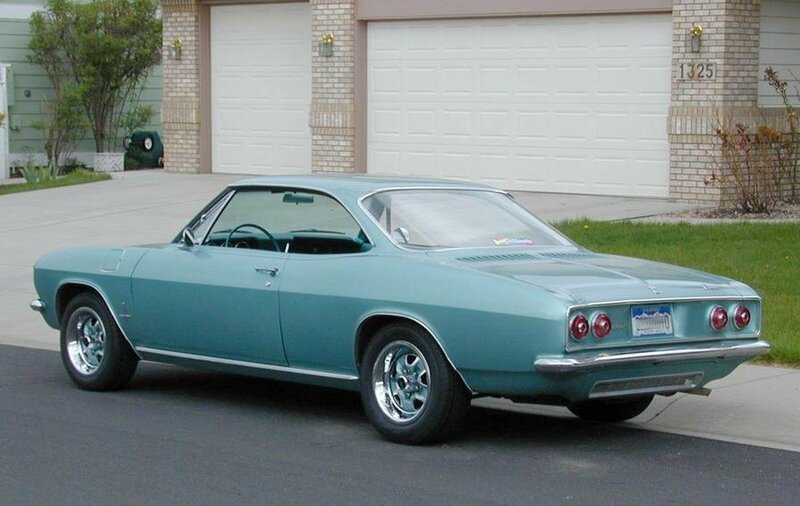 Chevrolet could have easily offered it, the wheels are stock 14x6 ralley wheels with 4" of backspace, with 195/70-14 tires. These are a good match in size to the 6.50-13s that came on the '65s. 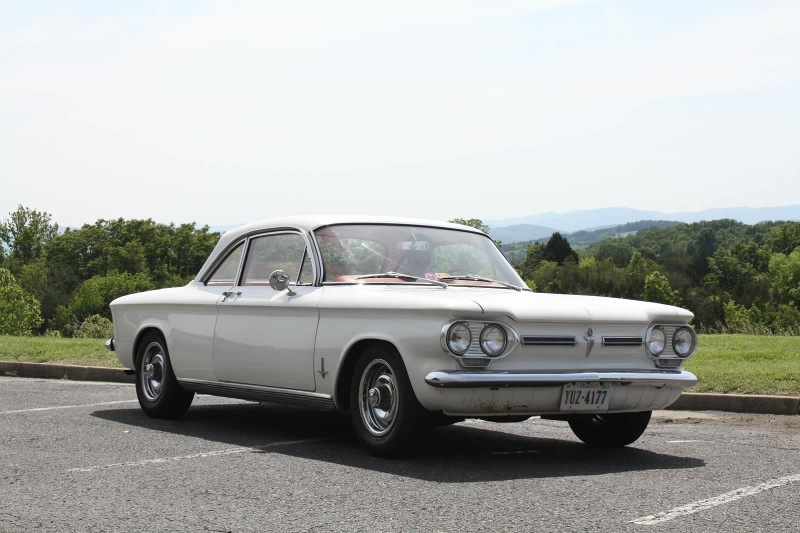 This is Greg Miller's '65 Corsa 140. Hi, my name is Greg Miller and I'm now the proud owner of Bob Ralston's 65 Corsa that has been displayed here for years. It now sports 195/60R14 tires all around instead of 205s on the rear, due to availability. My next set of tires will be 215/60 R 14s when needed. 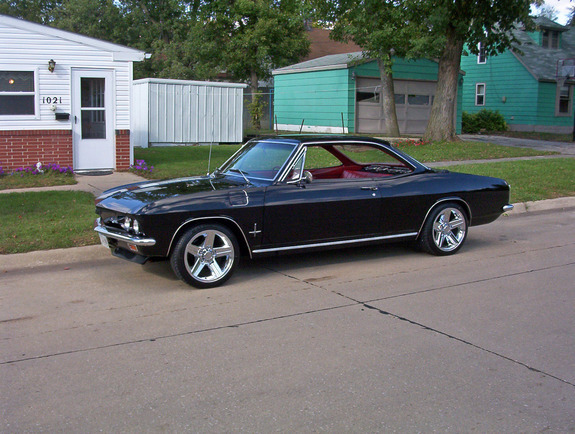 Future plans include DIS and TBI. A fresh coat of paint is in it's future as well. Even with what is now a "10 footer" paint job, she still turns heads and gets a lot of love from the public at the car shows I enter her in. 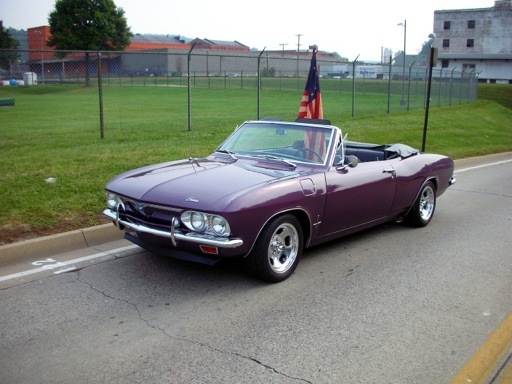 This is Art Griffiths' '65 Monza convertible with 3 liter roller cam weber engine. 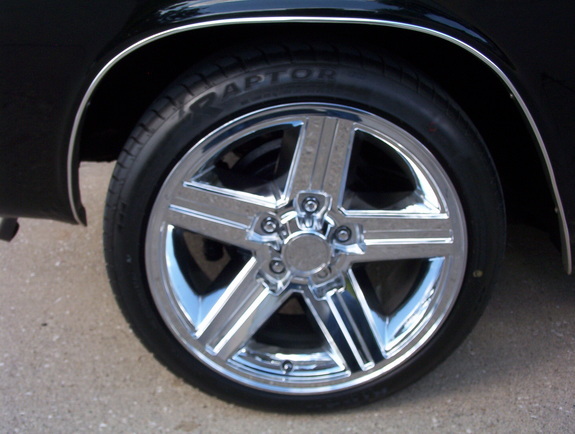 Rear wheels 16x8, 5" backspace with 245/45-16 tires. Also have disc brakes so subtract ~1/4" to 3/8" if drums [the disc hat is thicker than the drum it replaces --BB]. Have the Crown bracket redrilled 3/4" above existing hole. I do have some rub marks on the Crown swaybar but the only way I can get them is to be somewhat unsprung (suspension hanging down) and I think it's mainly with the Hoosiers - on different wheels. 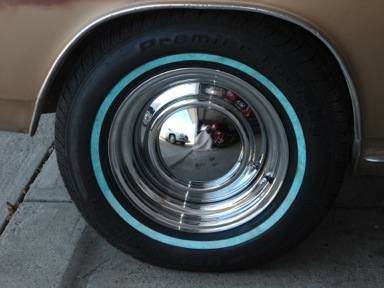 Fronts 16x7 4.74 backspace - again for disc brakes, 225/45-16 tires. Some rubbing on the swaybar, more pronounced with the slicks on different wheels. Only at full lock left or right. I think the quick steering arms don't help on this thanks to the ackerman angles getting bad at full lock. 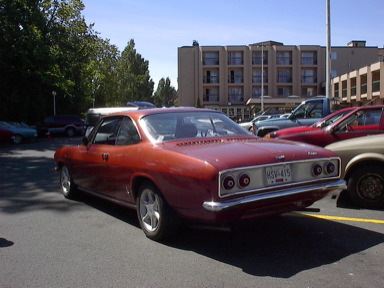 This is a picture from Portland (CORSA 2005 Convention). Car is lowered and no rubs. The wheel offset is crucial. 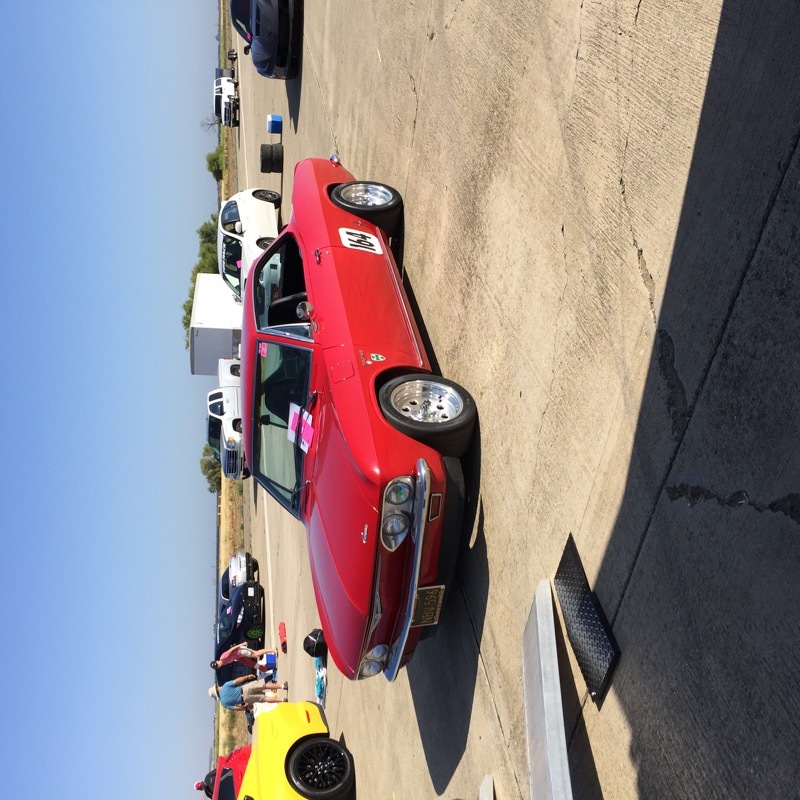 This is Steve Lovejoy's '65 Corsa autocross car. 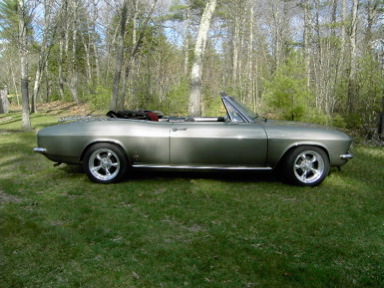 This is Dan Roraff's '65 Monza convertible. 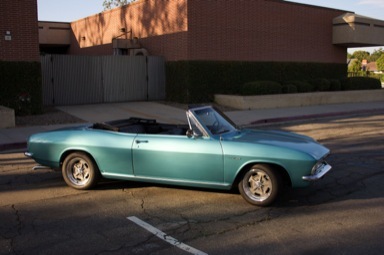 Here are three photos of my '65 Corvair with its new Cragar SS wheels. Size is 15x6. Tires are Fuzion HR1 195x60x15 on all four. Plenty of clearance. Ride actually is a little smoother and quieter then the 13 inchers. Steering effort is slightly less! Wheels were $122 each and tires only $48. The chrome on the wheels is excellent. Better than I had hoped. The back spacing on the Cragars are 3 3/8 inches. No noticeable changes, good clearance. The wheels (no tire) weigh 23.5 pounds each on my bathroom scale. 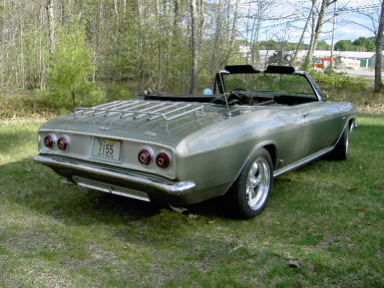 This is Roger's '65 Monza convertible. 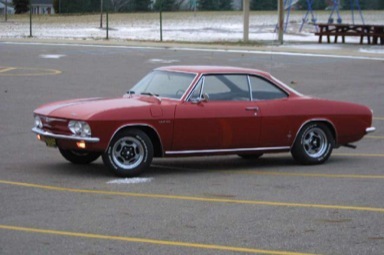 My '65 Monza-turned-Corsa has 14"X7" '78-'79 Camaro "Turbine" wheels (Option YJ8). 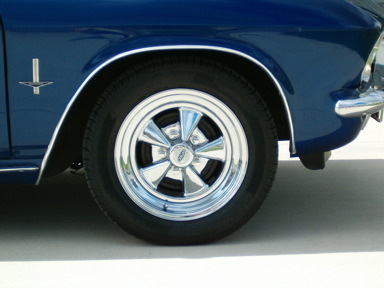 These wheels came in 14" or 15", with the 15" being supplied on the Z-28. 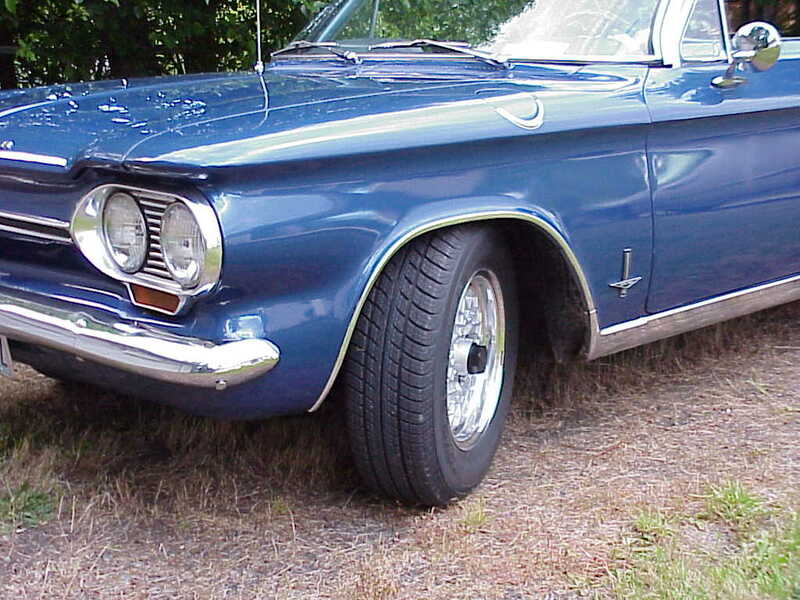 The tires are Firestone Turanza 195-65R14s. 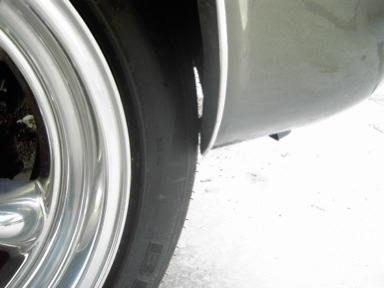 This combination gives about 5/8" of an inch of clearance at the front of the wheelwell, with no rubbing anywhere. These wheels are readily available on e-bay, priced according to how much time you're willing to spend polishing beat up old wheels. I paid $125 + $75 shipping for my set of 4 - and then spent about 40 hours polishing and painting them. I forget where I got the caps. This is Ken's "Barn Find" '65 Monza coupe. 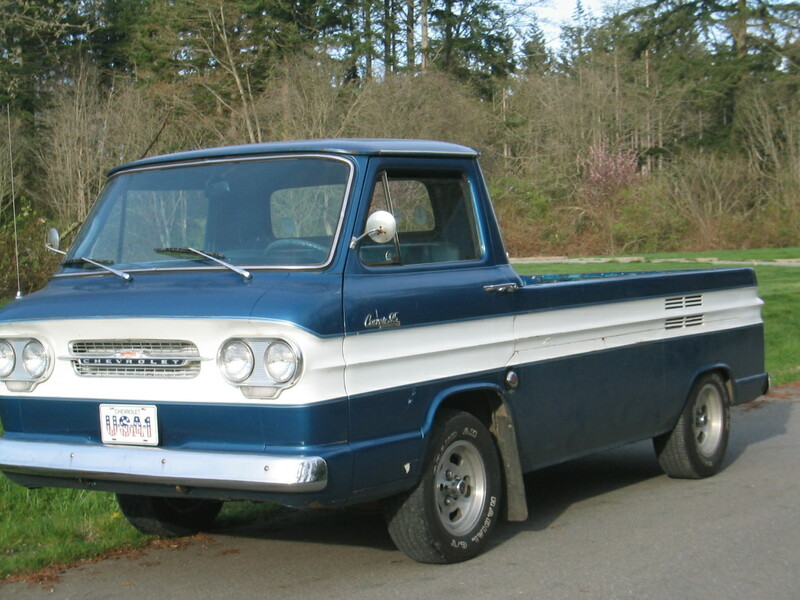 I have a nearly new old stock 6.50 - 13 that lived as an almost unused spare in a '65 I once owned. It measures just shy of 25 inches tall, is mounted on the original wheel and fully inflated. 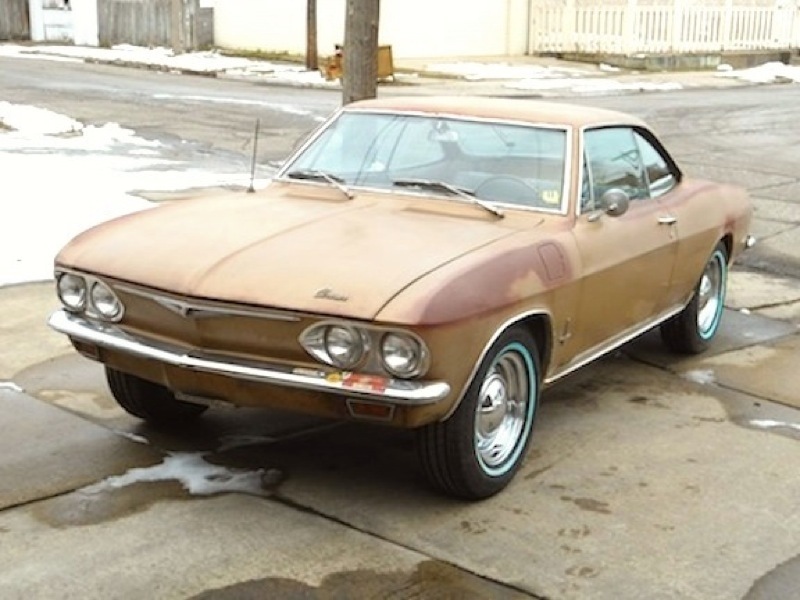 For the new tires I have a set of 14 inch wheels from a 1969 ElCamino but, as it looks like 14 inch tires may be going the route of the 13s in availability I decided to use a set of chrome 'smoothie' wheels which I won in a raffle at a Vacationland Corvair Club event some years back. These wheels are 15 inch diameter. 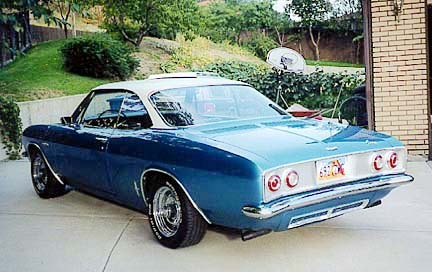 with both 4 1/2 and 4 3/4 bolt circles, 6 inches wide and with the 4 1/4 backspacing that is quite typical of GM cars back in the day. I selected B. F. Goodrich P215/70R15 Premier Touring tires [26 inches tall] for the rear and they fit without modification. I selected Bridgeston P205/70R15 Insignia SE 200 [just shy of 25 inches tall] for the front. Because the tread width is quite a bit greater than the original 6.50 - 13 the clearance at the lower edge of the front of the front fender is pretty tight. 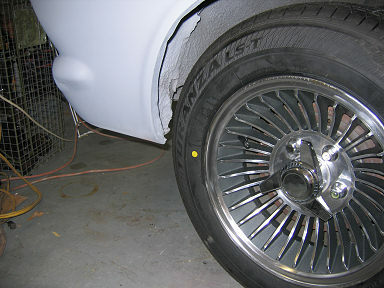 I will clay the fender in that area and test it on the road then I will decide if it will need to be altered for additional clearance. 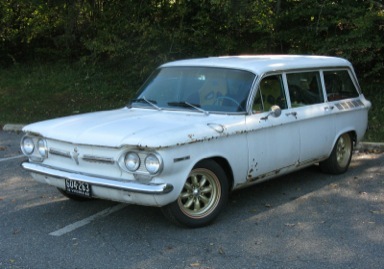 I really do not want to make any metal modifications to this rust free body if possible. 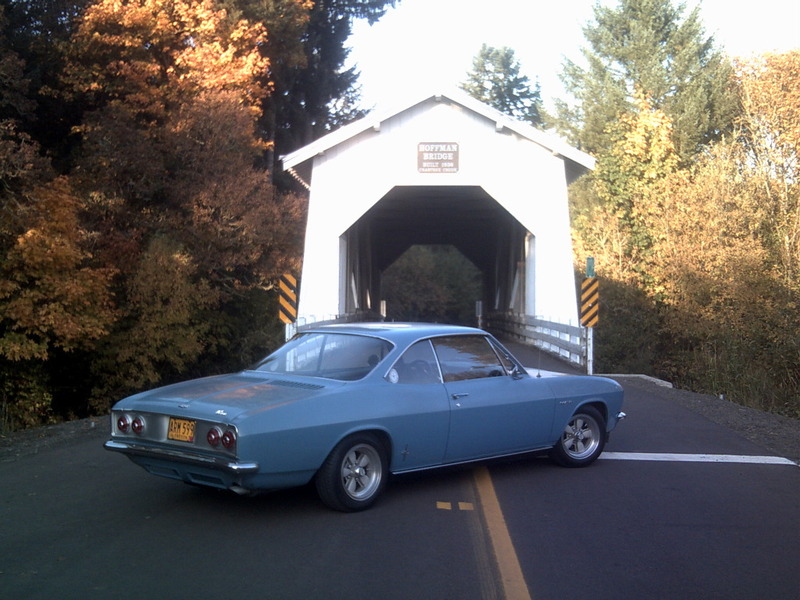 This is Phil's '65 Corsa Coupe. 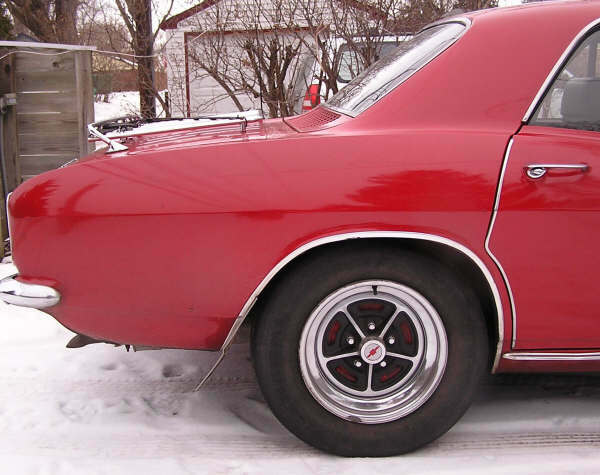 A few months ago, when I was in the decision-making phase of upgrading the wheels and tires on my 65 Corsa, you sent me a message suggesting that in a 15X7" wheel a backspacing of 4.5" to 4.75" would actually be preferable to the 4.25" that is found on the Camaro wheels that so many people use. That made sense to me since it puts the extra width on both sides of the wheel rather than only outboard. I took your advice when I ordered new Minilites. They're 15X7" with 4.5" backspacing. The tires are Falken RT-615 in 205/50-15. There is lots of clearance all the way around in all driving conditions. 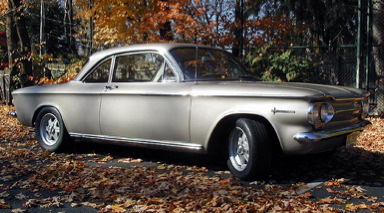 There is no interference with the fender trim or the stock (not lowered) suspension. The best part is the way the car is transformed. The wishy-washyness on center with 185/80-13s is gone. The car tracks straight and feels much more solid on the road. Occupants feel road imperfections only slightly more, while the driver has much better feel of what the suspension is doing in interacting with the road. 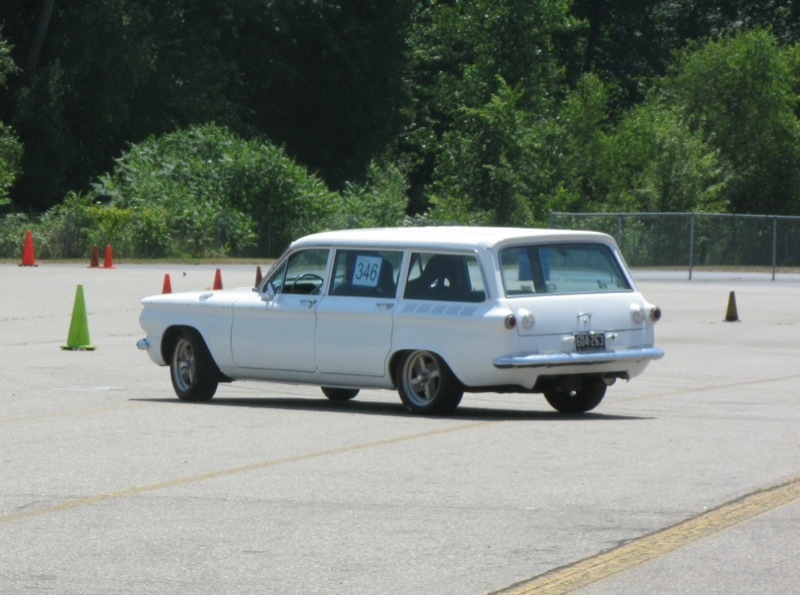 Steering effort is only slightly higher, but steering feel (feedback) is greatly improved. Cornering force and handling quality is on a completely new level when compared to the stock tires. Although my car is not a Yenko Stinger, it certainly begins to look a bit like a Stinger clone with these wheels/tires. Almost everyone who has seen the car since I changed the wheels has commented about how great the car looks with them. 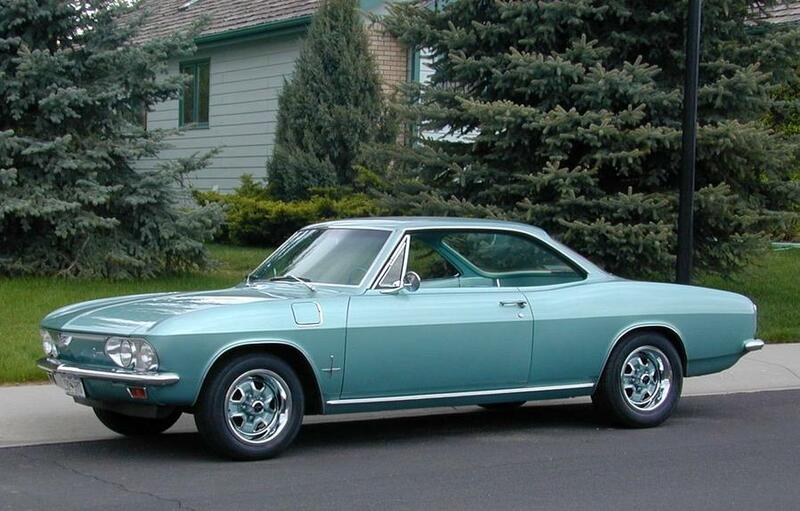 This is Norm's '65 Corsa Coupe. The tires are 205 70R14 BFG Radial T/As; the rims are vintage Motor Wheel Spyders. 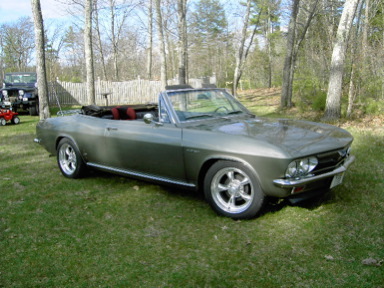 The car handles much better than it did with the skinny white walls, although the jury is still out on the look. 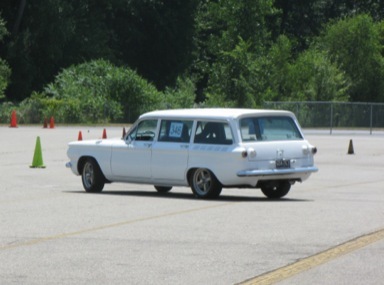 I think I will retain my stock wheels and wheelcovers and swap back and forth from time to time. This is John's '66 Monza Coupe. 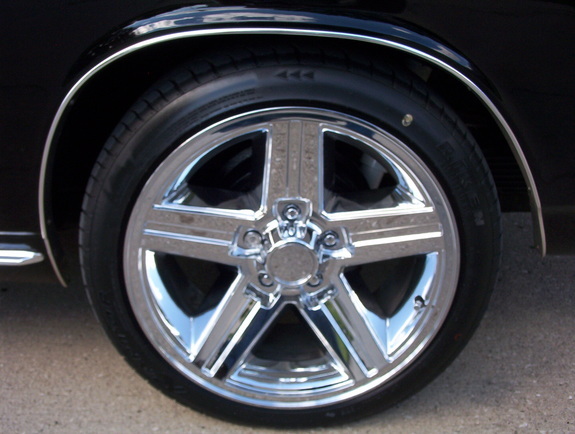 17 inch wheels are 17 x 8 with 4.5 inch backspace. Tires are Riken Raptor 215/45/17's. These wheels are IROC reproductions from Factory Reproductions in Chino California ... they only make this on wheel in 17's. 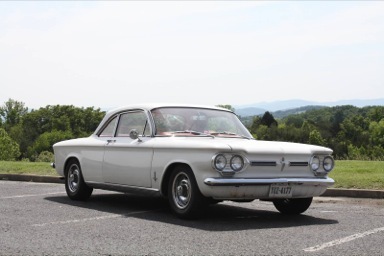 Joel has a '66 Corsa, he bought a set of TSW Kalaharis, they're intended for a GMC Jimmy or Chevy S-10 Blazer and have Yokohama A520 205/55-15 on them front and rear. 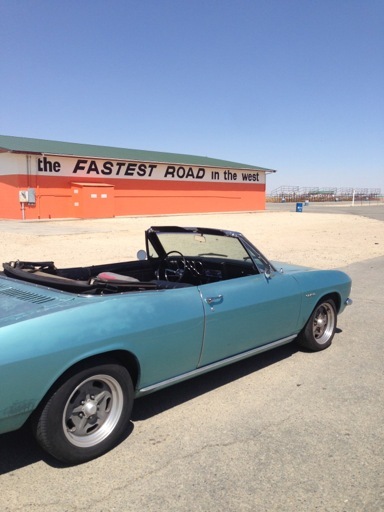 This is Anil Mittal's '66 Monza convertible. 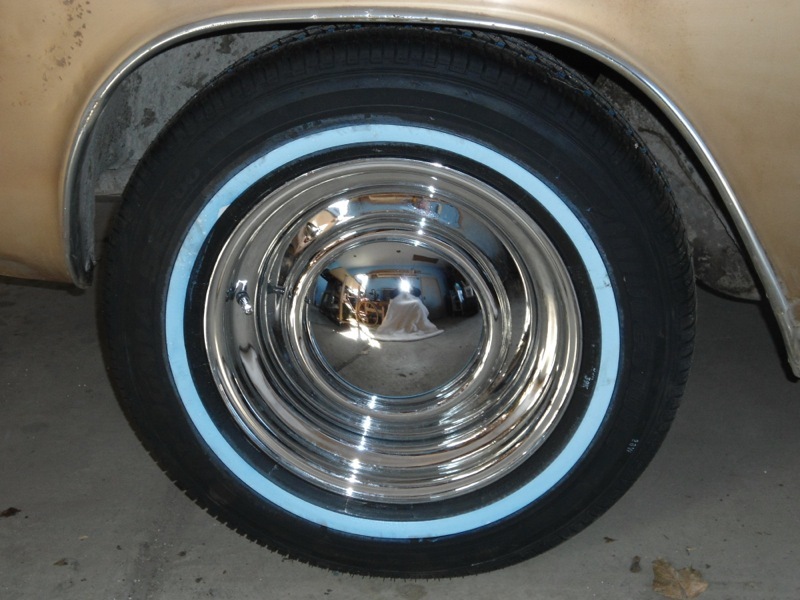 He bought a set of custom backspaced 15" x 7" 52 Series Olds SS Style wheels from Wheel Vintiques with 4 3/8" of backspace. Wrapped around the wheels are Yokohama AVS Db tires sized 205-60-15. As you can see, this combo fits nicely and looks good, he reports the handling and braking "...is like a night and day difference! 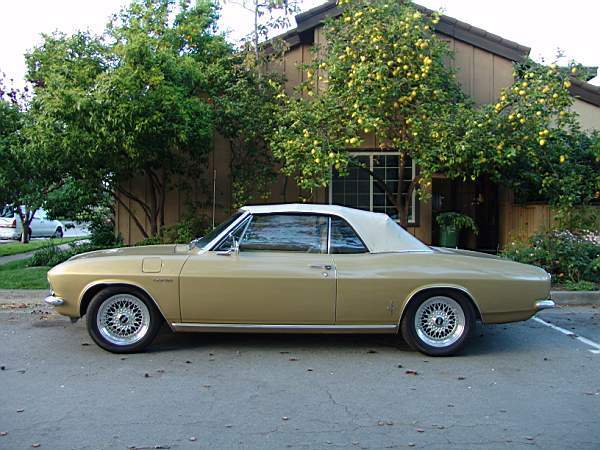 ", and best of all "There is no rubbing when the steering wheel is turned lock to lock." 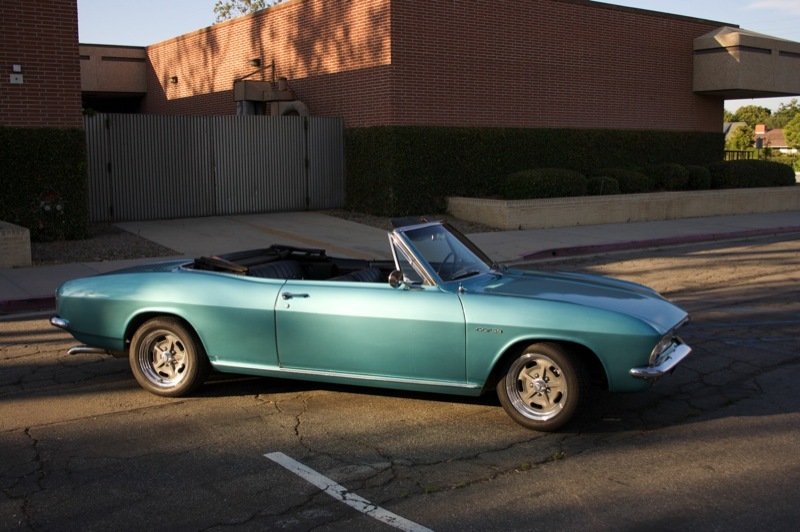 This is Jim Bannister's '66 Corsa convertible. I wound up with 205-55-16's on the front and 225-55-16's on the rear. The fit is perfect with no rubbing. The wheel are ex BMW 5 series 16" x 7" wide. They maintain the 1 inch offset like the stock wheels. One surprising thing though, the steering effort went WAY down. I have quick arms on the car and with the stock tires, parking was a real effort. I was totally surprised to find the effort so reduced. 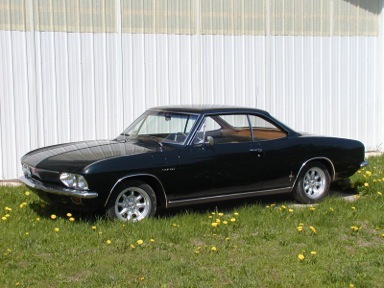 This is Vince's '66 Corsa. Here's a pic of my 66 Corsa. 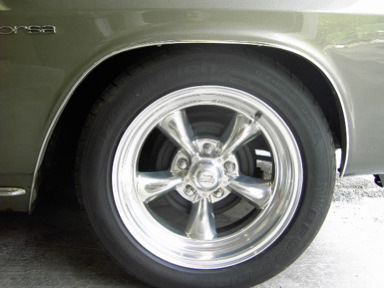 It has mid-80's Chevy Monte Carlo SS wheels, with BF Goodrich 205/50R15 tires up front, and 205/60R15 out back. It's lowered quite a bit, and I only have a problem with rubbing at full right lock going into a heavily sloped driveway (rt front under compression). 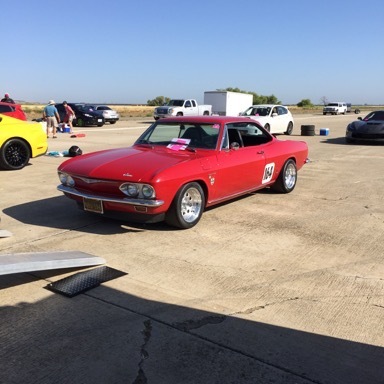 This is Max's '66 Corsa turbo convert. 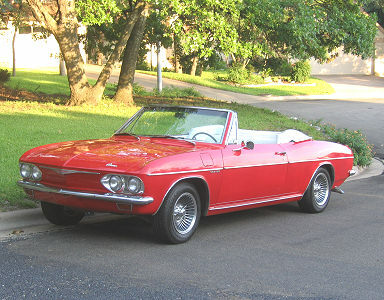 I bought my second Corvair Last January (the first one went away :-( This one is a '66 Corsa Convertible w/ 180 turbo. It is my daily driver and mods upgrades have been superceded by maintenance to this point. 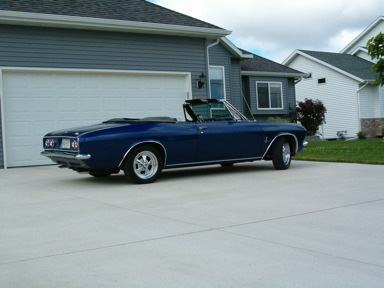 I have attached a pic from right after I bought it. These are wheels from the previous owner and I am going to be changing them along with other mods later. I will be going closer to the period with rallys and eventually I would like to put ARE Saltflats on when the budget allows. I wanted to send you an updated set of shots of my car for before and after. 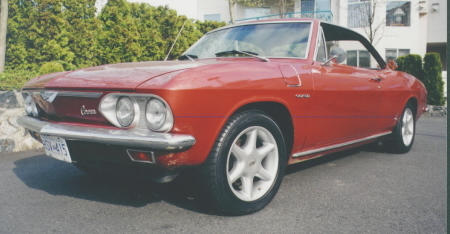 The wheels are 15x7" ARE Salt Flats (with grey paint option) They are a Halibrand replica and fit the early road racing period. I still play around with different tire combinations both size and compound. As a daily driver in LA I get lot's of opportunities to test it out. They fit great, have a great stance, do not rub but are a pain to replace and I cannot rotate. 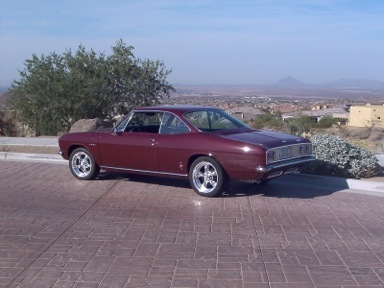 This is Jim's '66 Monza Coupe. 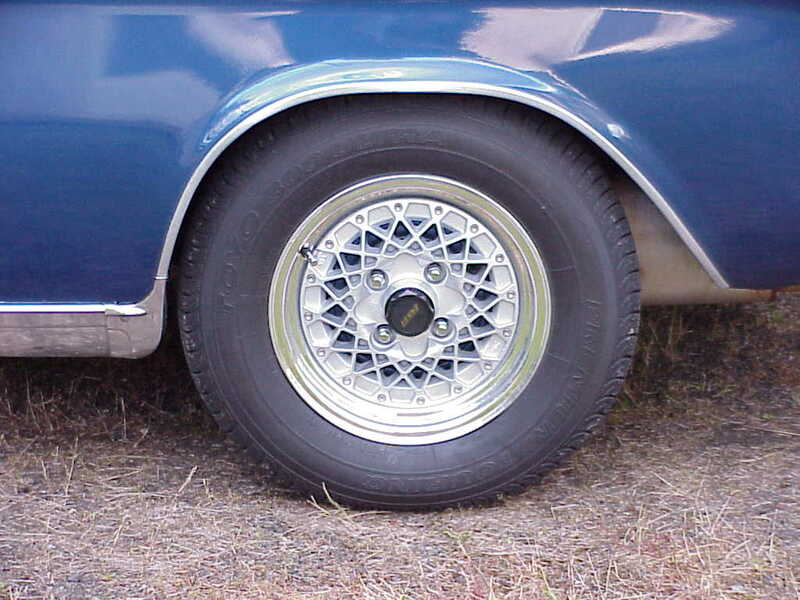 I am running 15 x 7" Olds Super Stock wheels on my late model Monza with stock suspension. The backspacing is 4.25". I mounted Yokohama AVS db S2 tires F: 205/60-15, R: 225/60-15. There is near zero clearance between the outside shoulder of the tire and the lower front part of the passenger side front wheel arch - I should trim that a bit, but it only rubs when I am braking while backing up and steering to the left just the right (wrong?) amount. Coincidentally, this combination makes the speedometer exactly correct, and 3000 rpm in high gear (3.55 rear end) is about 68 mph. 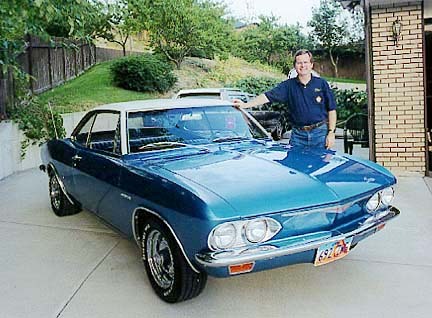 BTW, the Olds SS wheels are *very* heavy: about 27.5 lbs each - but they *look* terrific... ;-) They don't have quite enough backspacing (5" would be ideal, but 4.25" is the same as the wheels a lot of other Corvair owners are using), so there is a little "nibbling" at the steering wheel when the tires encounter road surface changes on one side or the other. 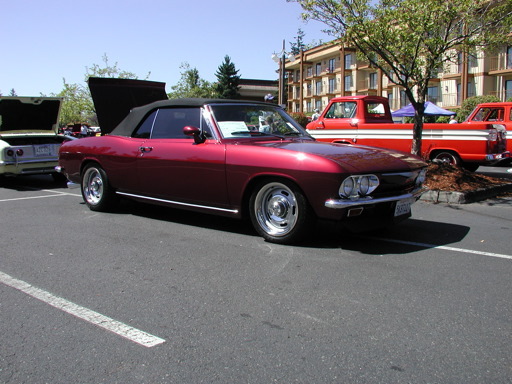 This is Ron Tinkham's '66 Corsa convertible. 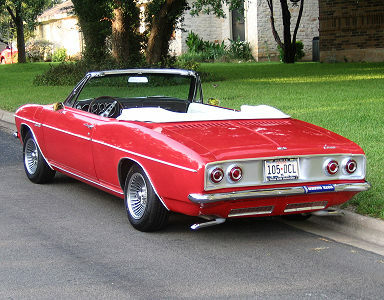 66 Corsa convertible. 2 inch HD drop srpings in front. About a 1 inch drop spring in the rear. KYB shocks front and rear. Nylon bushings on rear inner strut rod. Wheels are 16x7 Torque Thrust II's with 4 inch backspace. Tires are 205-55ZR16. Had to trim about 1/4 inch off of the lower front of the front fenders. This is Rick Norris' '67 Monza convertible. Ansen Sprints by American Racing. 15 x 8 rear and 15 x 7 front with 225-50 15 BFG g-Force Ultra HP tires. The 15 x 7 has a 4" back space. The 15 x 8 has a 4.5' back space. Wheels came from Wheels For Less, the cheapest place I have found complete with lug nuts and center caps included. 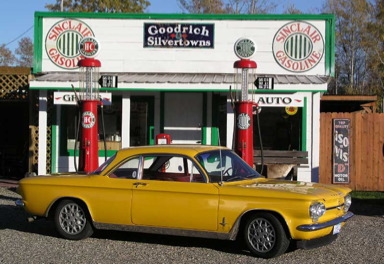 This is Fran Schmit's '67 Monza sedan. My red '67 4dr is shown with its classic 5 spoke chrome wheels found on many Buick models over the years. I use 15" rims on the rear [225 70 R15] and 14" rims [185 70 R14] on the front to give me a slight rake. It also keeps the speedo correct as well as giving me a 'proper' final drive ratio for my PowerGlide. With these big wheels driving the PG shifts (WOT) at about 5500 RPM and 50 MPH - just right IMHO. 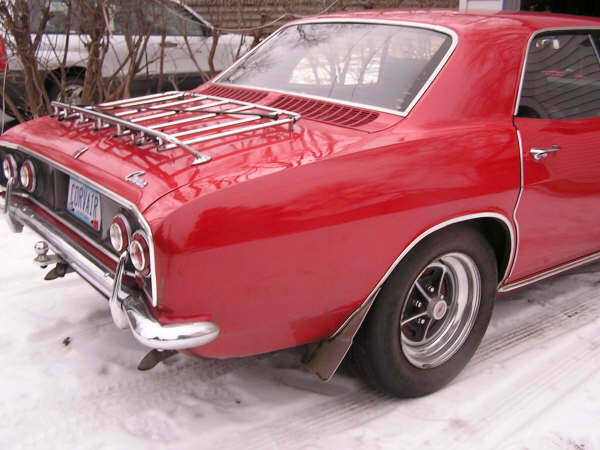 It's also a great winter car with just the right amount of traction. 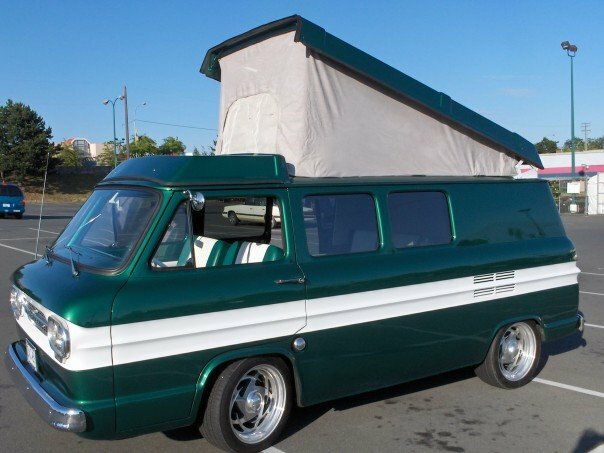 This is Mike's '64 "Westbrier" camper. I put 17x7s on the westbrier and they have never rubbed under normal driving conditions. Not to mention my front end is lowered. In my opinion they don't look too big. Note: the 17's clear the tie rod end in the front, as they have greater backspace than stock FC wheels. 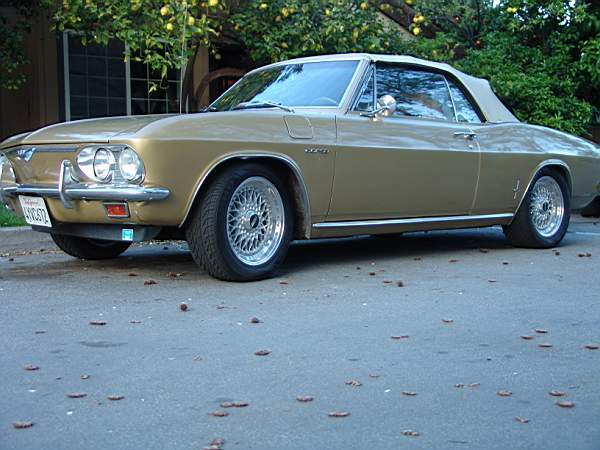 Also, this is a very unusual Greenbrier with delete rear quarter window and delete window winders on the rear. Mike found this out when he went to put in power windows and there were factory stubby widow tracks with stoppers intended to keep the window up with no winder. I purchased some aluminum slotted mags for my Rampside. They were advertised as (4) 14X6, but 2 of them turned out to 14X7. Put them on the Rampside and so far no problems. Last update: 03 October 2015. Copyright Bryan Blackwell.